One of the main goals of INTEGRAL is to study diffuse sources of gamma-ray line and continuum radiation.The 511 keV positron annihilation line and the 1.809 MeV line from radioactive 26Al are tracers of sites of nucleosynthesis in the past million years and diagnostics of the conditions in the interstellar medium. 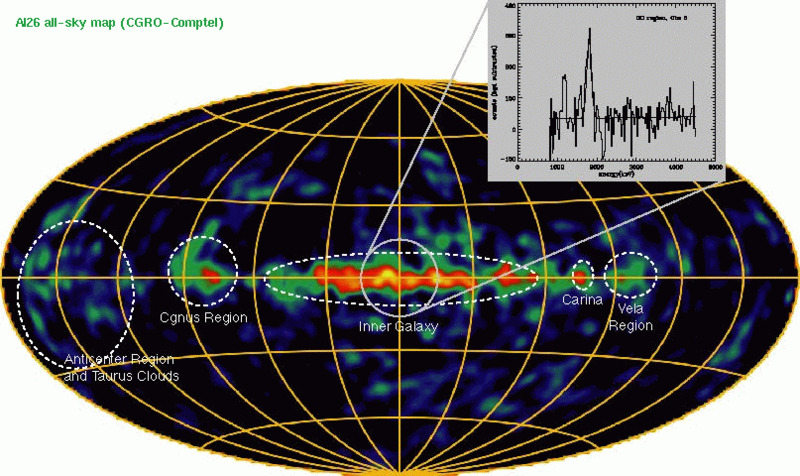 In the MeV range, the gamma-ray continuum is used to study the low-energy cosmic-ray electrons. Such studies are mainly the realm of the spectrometer SPI, but some results are also obtained with the ISGRI instrument. The inner Galaxy is a strong source of extended diffuse gamma-ray emission from positron annihilation. The origin of this radiation is under debate. Various sources, including Low mass X-ray Binaries, novae, supernovae, cosmic rays, superconducting cosmic strings and dark matter have been proposed. Older results (Dermer & Skibo 1997) obtained with the Compton Gamma Ray Observatory (CGRO) had indicated a possible feature 'above' the Galactic Centre at positive galactic latitude – the "Annihilation Fountain". Early INTEGRAL results showed clearly that the emission was concentrated in the central region with no conspicuous structures towards high latitudes. But more recent results indicate that the distribution is lopsided, which may be correlated with the distribution of LMXB in the galaxy (Weidenspointner et al. 2008). But not only the spatial distribution, also the spectrum of the annihilation radiation yields important information. As Churazov et al. (2005) found, the spectrum is consistent with being unshifted and the width of the line is very narrow with just 2.37±0.25 keV, the most stringent constraints up to date. The results are compatible with a single phase, warm and weakly ionized ISM. The radioactive isotope 26Al can be created in in various processes in stellar evolution. It decays radioactively to 26Mg with a half-life of ~720,000 years – still short on astronomical scales – emitting gamma-ray photons at 1.809 MeV. Previous observations by the COMPTEL instrument onboard CGRO, had shown that the line emission is concentrated in the Galactic plane, especially the Inner Galaxy but also, e.g., in the Cygnus or Vela regions. Measuring shifts in the line energy at different regions with unprecedented resolution, Diehl et al. (2006) showed that the source regions for this emission corotate with the Galaxy, consistent with a Galaxy-wide origin, rather than from foreground regions with local and peculiar 26Al production. The present-day equilibrium mass of 26Al was found to be 2.8±0.8 solar masses, which in turn allows to estimate the frequency of core-collapse supernovae as 1.9±1.1 events per century. 60Fe with a half-life of ~1.5 Myr is expected to be produced in core-collapse supernovae, similar to 26Al. The detection of line emission at 1173 keV and 1333 keV was first reported by Harris et al. (2005) and confirmed by Wang et al. (2007). The flux ratio 60Fe/26Al was found to be substantially below the factor ≥0.40 predicted for massive stars by previous model calculations, but more recent predictions have come down again to 0.185±0.0625, in line with the observed value of 0.148±0.06. Using the ISGRI imager, Renaud et al. (2006) detected both the 67.9 and 78.4 keV 44Sc γ-ray lines in the SNR Cassiopeia A. Compared to previous observations the better energy resolution allowed to clearly separate both lines and the imaging in narrow spectral bands confirms the spectral results. Combining COMPTEL, BeppoSAX PDS and ISGRI measurements Renaud et al. derive a relatively high mass of synthesized 44Ti (1.6+0.6-0.3 × 10-4 solar masses), sugggesting that Cas A is peculiar in comparison to other young supernova remnants, from which so far no line emission from 44Ti decay has been unambiguously detected.